Hon. Nicole R. Nason confirmed as the new FHWA Administrator. Published on March 29, 2019 in Daily Dirt and National. Closed Tags: American Concrete Pavement Association (ACPA), concrete, construction, construction industry, Federal Highway Administration (FHWA), Federal Highway Trust Fund, highways, infrastructure, Interstate Highway System, roads, safety, transportation. The American Concrete Pavement Association (ACPA) extends its heartiest congratulations to the Hon. 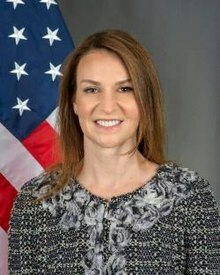 Nicole R. Nason following her confirmation as the 26thAdministrator of the Federal Highway Administration (FHWA). The U.S. Senate voted 95 to 1 in favor of the confirmation. Ms. Nason is the former National Highway Traffic Safety Administrator (NHTSA); previously served on the Board of Directors of Mothers Against Drunk Driving (MADD), and has vast experience with both the Executive and Legislative branches of the Federal government. Founded in 1963, the American Concrete Pavement Association is headquartered in Chicago at 9450 West Bryn Mawr Ave., Suite 150, Rosemont, Ill. 60018. Visit ACPA on the web at www.acpa.org.